Be a part of our WOW! Matters culture where we are raising the standard of apartment living through our commitment to exceptional service and never ending focus on the core elements of our residents’ living experience. Part of our WOW culture can be heard through our stories of great customer service that highlight our Customer Service Values & Promises. These stories were published in February 2012 and our WOW! Matters 2012 book can be purchased at Amazon, but why wait? Read for Yourself about WOW! Moment after WOW! Moment right now. 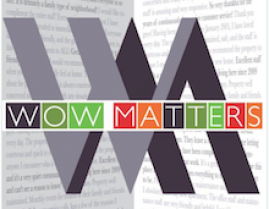 Click on the appropriate year to read our WOW stories from each book – 2009, 2010, and 2011.